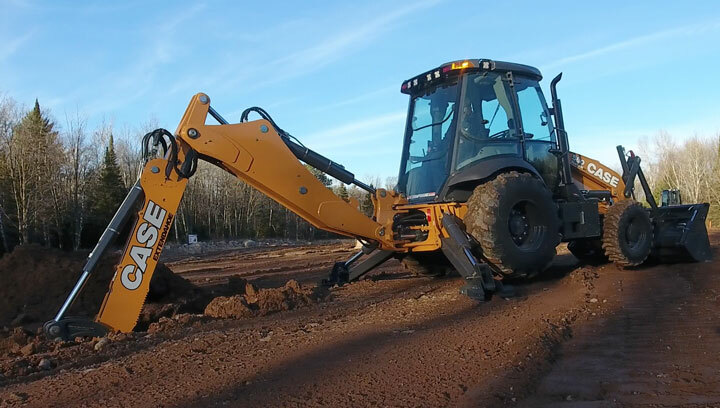 Case Construction Equipment has introduced several machine enhancements to its N Series backhoe loaders incorporated throughout the machine — from cab and drivetrain improvements to enhancements to the hydraulic and electrical systems. Case has also made standard several options that were previously optional, and now offers an increased suite of factory options on all N Series backhoe loaders. The fuel economy package, which was previously optional, is now standard. This includes ECO mode switches for both the loader and backhoe functions, which allows for greater fuel savings, and optimal power and performance. The package also includes the Auto Engine Idle feature, which brings engine RPMs down to idle when the backhoe controls are not used for a set period of time. The engine will also shutdown if the machine idles for a set period of time. Both Auto Engine Idle and Auto Engine Shutdown have adjustable settings to customize the timing to the operators’ style and preference. Another great feature now made standard is the Engine Protection Shutdown mode, which turns the engine off if engine temperature, drivetrain fluid temperature or engine oil pressure go out of normal operating range. Discover more about CASE Construction Equipment here.